In our previous posts about the Case-Mix Index (CMI), we explored what it conveys and how it is calculated. Today we will look who looks that the CMI and how they use it, including both clinical and financial entities. As a brief recap, the CMI is a number that represents the average severity (and consequentally, cost) of patients in a hospital during a set period of time. Typically, higher CMIs mean more complicated services and as a result, more income, and lower CMIs mean less complicated services and lower income. However, a hospital's CMI is only as accurate as its clinical documentation. To accurately code a patient's treatment, the physician must document each complication. The doctor's notes must then be accurately translated into DRGs by the medical coder. As a result, one of the groups most interested in CMI are those individuals responsible for Clinical Documentation Improvement (CDI), that is, the accurate recording and coding of the hospital's medical procedures. CDI professional serve as an intermediary between the physician and the coder, making sure that all appropriate services are accounted for. However, private hospitals have the resources to invest in this degree of documentation, while many public hospitals do not. This leads to a financially painful situation for hospitals with severe cases and fewer resources. The reason for this pressure on accuracy is that the CMI plays heavily into the financial health of a hospital. The CMI, because it is calculated using Medicare diagnostic groups, is an indication of the amount of reimbursement a hospital can expect. If the CMI used by the finance departments is inaccurate, then the hospital budget is inaccurate, spelling a possible disaster for the facility. The CMI also provides an indication of financial risk. Monitoring the ongoing CMI - which can be easily calculated internally, gives the C-suite advance notice of dips in income, allowing them time to make adjustments to compensate. In this way, the CMI supports efficient resource management. 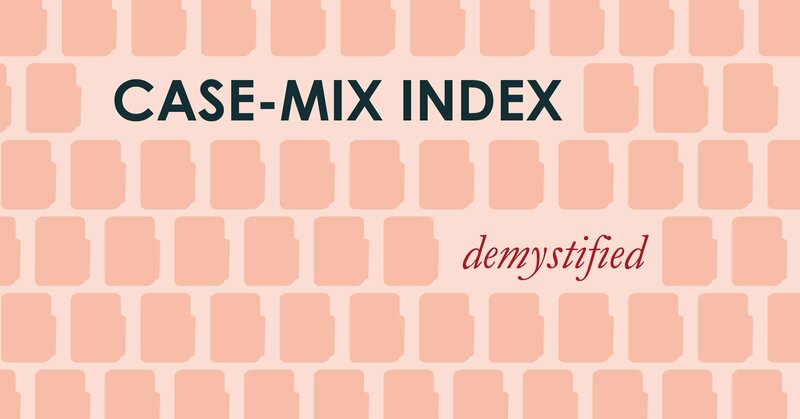 This concludes our series on the Case-Mix Index. We hope that these posts helped introduce this critical but often misunderstood number!